Ok people, I know this Haralas design is totally a Marni SS 2008 knock-off (if you don't remember that specific style just take a look here and here) but I simply couldn't resist when I found it for half-price off in Avenue Mall's All About Shoes shop. 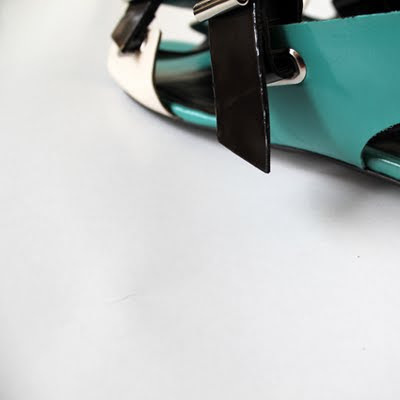 I just fell in love the turquoise/black/white combo and the fact that it has a round toe line instead of the original design's super pointy style. Still feeling kinda guilty for the original designer though... Should I? Would you? It's a really nice design. But no, you shouldn't feel guilty. High street stores do this all the time. I've already bought two pairs of shoes that are Brian Atwood's look alikes and one bag which is a combination between the Mulberry's Alexa and the PS1. If they don't have a fake designer tag, you shouldn't worrry about it. All designers are being imitated. That's how things work. Whether we like it or not. Don't you dare feel guilty Marni should feel guilty for their prices and for the record i simply adore Marni and those are some knock-out sandals. what do you mean "should I". of course you should. besides, they work better with the round toe, non. very nice. αντιλαμβάνομαι τον προβληματισμό, αλλά η μόδα αλλάζει τόσο γρήγορα που δεν υπάρχει χρόνος για τέτοιες απορίες!! με γεια! einai fantastika! k pisteuw tairiazoun polu sto stul sou! megeia! kai xwris enoxes-ennoeitai!